Hummingfluff.com - Devlog for "City of Hunger"
Hello everyone, to a brand new year and a brand new update! Last month's was almost completely consumed by the SSSS book Kickstarter as you know, except for one week of Christmas break when I had nothing but my dingy laptop with unity installed on it at my disposal. And that week (minus the time spent eating holiday feasts with family ;3) was more than enough to get enough coding for a fairly big update. Bleed: you can inflict bleeding, which causes the being to lose 3% of their total hp at the end of its turn. You can keep stacking on bleeding up to a total of 5, aka -15% of hp every turn. Very handy for whittling down enemies with lots of hp and high defenses. Burn: A creature inflicted with burn will lose 5% of their hp each turn, but more importanly they will be prevented from regaining any hp while burnt, both from healing moves and items. Useful for crippling enemies that keep healing themselves. Defense buffing and decreasing: All damage that a creature would take from an attacking move is reduced by their defense (as a direct percentage), so if someone has 99 in defense they'll only take 1% of any damage dealt to them. Defenses can be both raised and lowered, but at the end of each turn the raised/buffed defense will slowly move towards the "natural" value of the creature, so it's really advantageous to have a naturally high defense. And even more important to have some moves to lower enemy defenses in case you run into something with ridiculous natural defenses, or self-buffing abilities. The comboing symbols actually matter now. In the first demo the symbols were there, but had no funtionality, so you could freely link any card with anything. Now you have to be a bit more tactical and occasionally make judgement calls on how to best utilize a card in different situations. The comboing rule is that you need to find a card with an upper/main symbol that matches one of the lower row symbols of the card you're trying to link to. As seen above, only Reynir's cards are viable to use as support cards here, because they've got the needed medic symbol on top. There can be up to 3 symbols in the lower row (the more symbols the easier to find a match for that card, naturally),while the upper row will only ever have one symbol. Escaping: Running from a battle is no longer a guaranteed escape. The higher the levels and "rarer" the enemies are, the lower your chances are to escape. The probability is dispalyed below the "run" button( the text is unformatted and ugly still, but works properly.) If you're already a few levels above all of the opponents you have a 100% chance to run without any trouble, but in the scenario in the top picture it's only 15%. Failure to run leads to the enemies getting a completely free turn, but after that you will automatically escape, hopefully still alive. So now it's not completely risk-free to carelessly run into a a battle if you're dangerously low on health. Dealing a new hand during your turn: You can now click on the deck icon and all the cards currently on your board will be shuffled back into the deck and re-dealt. You get one re-shuffle every turn (I might increase it to 2 if it turns out to feel more fun). Only cards on the "board" area get reshuffled, not the "use move" area. So for example, if you happen to have a really good card in your hand, but nothing to link to it, you can place the card in the move slot to save it and then reshuffle the rest for a chance to get something linkable out of them. Using items in battle: as straightforward as it sounds; you can use items while in battle now! You're limited to 1 item per turn, plus a one turn cooldown afterwards before the option becomes available again, so you can't rely on spamming items constantly. There we go, that's the end of the new stuff. The battle system itself is almost complete now! There's little things still missing, like ability to cure bleed and burn, but it's pretty much got everything that I had planned when designing it. Of course all the work of adding new enemies, bosses, some move animations, balancing cards and stats are still ahead, but that's mostly a matter of just slowly and persistently adding, testing, drawing, adding, testing. 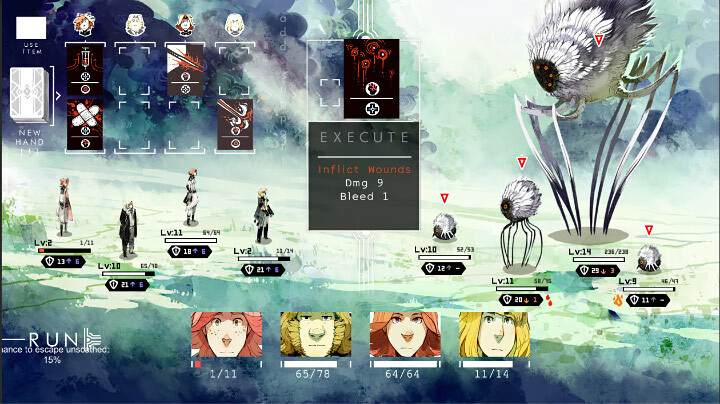 The coding of the battle system's core is the most complex part that this game was going to (and will) have, and the part I was most worried I wouldn't be able to pull off when I decided to try making this project in the form of an RPG game rather than just some sort of visual novel-like thing. So I'm quite happy about that, and glad I made the decision to at least try.